Awards 2009 issue on sale now! | What Hi-Fi? Awards 2009 issue on sale now! Our special edition issue of the magazine, with its snazzy gold cover, is in the shops now. Buy it, and inside you'll find a unique golden ticket which gives you the chance to win one of our fabulous Award winners. And if you're in the market for a new TV, Blu-ray player, hi-fi or home cinema system, this is one issue you can't afford to miss. It's packed with in-depth reviews and stylish pictures of every Product of the Year and all our Best Buys at a range of prices and sizes to suit your needs. We've covered everything, from TVs, hi-fi and home cinema, to iPod docks, DAB radios, portable music players, headphones, cables and all manner of accessories. But that's not all. The issue is also bulging with 27 exclusive First Tests, including Sony's superb new BDP-S760 Blu-ray player, the Marantz SR6004 AV receiver, a great budget projector from Epson, Naim's fine-value CD5 XS CD player and another stunning TV from Philips, the 47PFL9664. 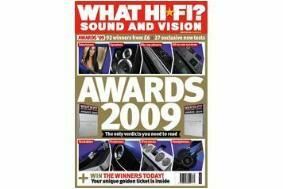 You can also find out what won our 2009 Readers' Award, voted for by you, the readers of What Hi-Fi? Sound and Vision and whathifi.com, in our online poll. And finally, check out the video reviews of all 18 Products of the Year on our dedicated Awards website.